The Nelson Thin Edge Bed is a mid-century modern wooden bed frame featuring a slim horizontal platform profile and angled headboard. Designed by George Nelson in 1954, the Nelson Thin Edge Bed has proved to be a timeless bedroom piece that has been updated today to include solid ash slats that replace the antiquated spring system, and updated sizes to reflect trends toward larger mattress sizes. The Nelson Thin Edge Bed (Queen Size) has a length of 89 1/2” | 227 cm, width of 63” | 160 cm, headboard height of 35” | 89 cm, and platform height of 13 1/4” | 34 cm. The top mattress surface of the Nelson Thin Edge Bed has a typical height of 23 1/4” | 59 cm from the floor if a 10” | 25 cm modern mattress is used. What is the Nelson Thin Edge Bed? The Nelson Thin Edge Bed is a mid-century modern wooden bed frame featuring a slim horizontal platform profile and angled headboard designed by George Nelson (1954). 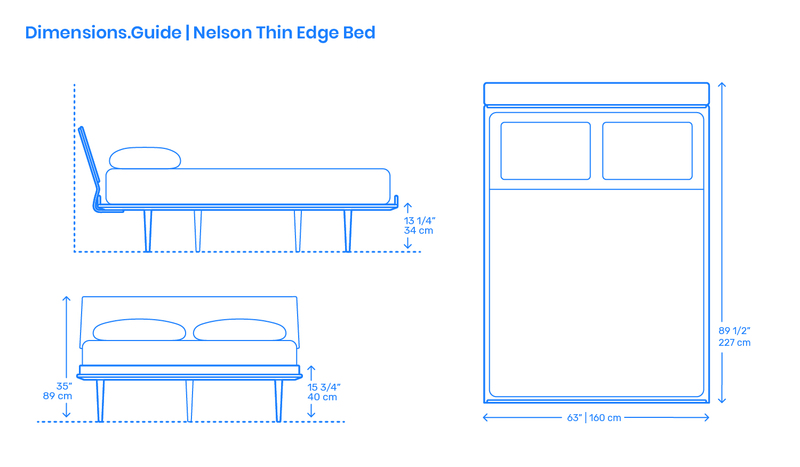 How big is the Nelson Thin Edge Bed? The Nelson Thin Edge Bed (Queen Size) has an overall length of 89 1/2” | 227 cm, width of 63” | 160 cm, headboard height of 35” | 89 cm, and platform height of 13 1/4” | 34 cm. How high is the bed surface on the Nelson Thin Edge Bed? The overall bed height of the mattress on the Nelson Thin Edge Bed is 23 1/4” | 59 cm from the floor if a typical 10” | 25 cm modern mattress thickness is used.